I'm still in the process of discovering how I want the picture to be looked at, or even more basic, discovering how I look at pictures myself. This chapter has been a great help and has made me more and more aware of the processes that take place when looking at an image and the active part I as the photographer can play in how a scene or subject is perceived through the design. This exercise starts with having a look at two photos with a lot of movement and decide which direction the subjects are moving. Here they come! Of course, the movements of the bull and man are not as straight as the lines might suspect. But I think the general movement is that they will both go backward and turn around. Out of the way the man is leading the horses and the direction they're looking at, it can be assumed that the horses will gallop in front of the lens and the man will face the lens forward in just a few seconds. I looked through some of the pictures I have taken in this past week. With some I had this exercise in mind, with other pictures I discovered the line after seeing them on my computer screen. As the lines show, there is a lot of dynamic and movement in this photo. It was an incredibly high wave day I have to say! 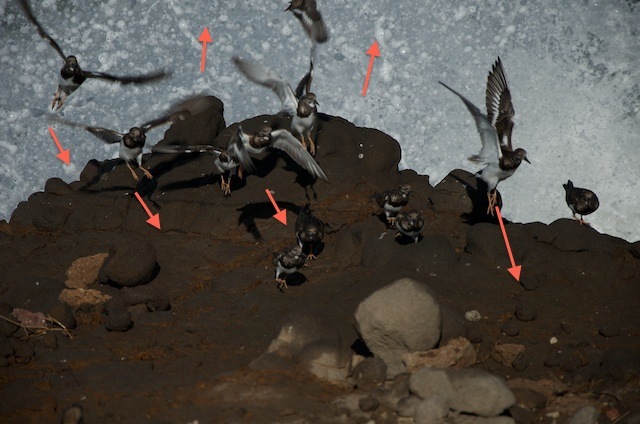 I was standing on the top of the cliff that you can see in the photo above, about to take a photo of the birds who were all looking in the same direction, when a humongous wave scared us all! I was soaken wet, but happy with the result! The next photo wasn't particularly planned as it is asked for in the exercise, but I took it when I got off the ferry. The lady in the back had been sitting there, constantly looking down, as if she was trying to ignore somebody. Then the passengers got off the ferry and walked past her and I could see her curiosity taking over. You can just see her looking up at the man in the red shirt. In the meantime the people passing are focused on getting off the ramp. I really like the eye lines in this photo. The lines of the back of the ferry diagonally point towards the island we have just left. One thing I really need to work on is setting up similar lines in still life scenes. I find that so difficult! So more on that in an upcoming blog.